Overall Dimensions:6-1/4 " x 3-1/8"
It's groovy, man! Come and check out one of the best and handiest items you will want in your bulk foods section or kitchen. 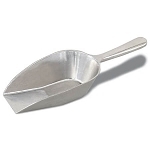 This metal 12 Ounce Aluminum Scoop with a grooved handle provides comfort for employees and customers. This particular ladle measures about 6 1/4 inches by 3 1/8 inches in size. 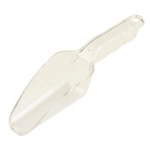 Aluminum Scoops are sturdy and have been proven to stand the test of time. A great utensil for dishing out approximately 350 milliliters of bulk items such as dry coffee beans, salted nuts, loose dog food, individually wrapped candy, and other scoop-able materials. Pair this larger sized dipper up with a few of the smaller 5 ounce scoops for added convenience when portion control is in order. 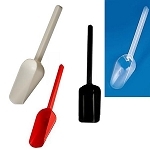 Our round bottom metal scoops are highly polished inside and out to give you that gleam that looks great at all times. Go ahead and purchase your handy dandy kitchen utensil from us today and save! Overall Dimensions: 6-1/4 " x 3-1/8"